This do-it-yourself project gives children a multi-sensory learning experience. Use these simple instructions to make scented gelatin paint for children. This project provides a multi-sensory teaching tool for children with learning disabilities in special education programs or mainstream classrooms. The recipe is designed for preschool children or children in the primary grades of elementary school. It allows kids to branch out from traditional classroom lessons. Follow the directions to make a small batch of scented gelatin paint for you and your child at home or a larger batch for classrooms. Pour the water into the container, and carefully add the gelatin mix. Stir well until mix is dissolved. The intensity of the colors depends on the amount of food coloring you use. Reserve unused powdered mix for future use. Place lids on the containers. Scented gelatin paint will thicken over time and eventually become too thick to paint with. Apply the scented gelatin paint using paintbrushes because gelatin can stain fingers. Paint onto any type of paper, and lay the paper flat until completely dry. Display the artwork at "nose" level to allow your children to enjoy their creation. Artwork will smell fruity for a few days. Wash hands after use, and have children wear smocks to prevent stains on clothing. 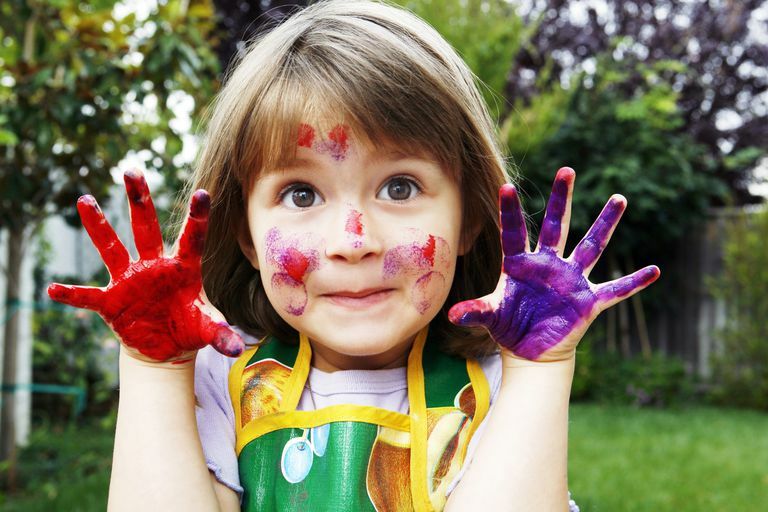 Although the ingredients are edible, children should not eat the scented gelatin paint. Using finger paints as a multi-sensory teaching tool is a great way to introduce color concepts, shapes, alphabet letters, sight words, and free-form artwork. Children can add details using markers and crayons, which can be used to create fine details. The gelatin works best when used to color large open areas of drawings. For best results, make only enough gelatin paint to use the same day, as it will thicken over time and not be suitable for painting. Gelatin can easily stain fingers, clothing and other objects. This mix should not be used for finger painting and cover work areas with old newspaper. How Do Kids Learn to Read?